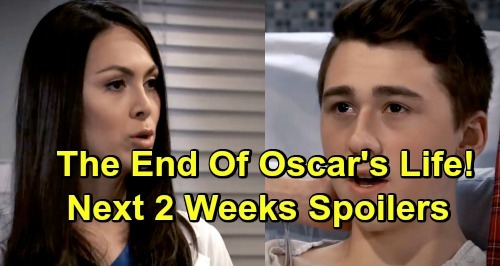 General Hospital (GH) spoilers for the next two weeks tease that some surprises are coming up in Port Charles. During the week of March 18-22, Julian Jerome (William deVry) will try to help Dr. Kim Nero (Tamara Braun). He’ll know she must be a mess over Oscar Nero’s (Garren Stitt) looming test results, so he’ll put together a care package for her. Kim may be touched by the gesture, but she’ll probably be a bit distracted as well. She might find herself leaning on Drew Cain (Billy Miller) more often, which could lead to familiar problems with Julian. As for Oscar, he’ll indeed get those test results this week. Oscar will likely find out his reprieve is over, but how much has his tumor grown? The answer will affect how much time Oscar has left. Over with Carly Corinthos (Laura Wright), she’ll battle some worries. Perhaps Carly will fear the worst when she doesn’t hear from Sonny Corinthos (Maurice Benard). He’ll be busy trying to make a getaway with Dante Falconeri (Dominic Zamprogna) in Turkey, but Carly will be left in the dark. During the week of March 25-29, Kristina’s family will grow increasingly concerned. Michael Corinthos (Chad Duell) will share how troubled he is by Kristina’s behavior and faith in Shiloh. Alexis Davis (Nancy Lee Grahn) will end up getting in touch with Jordan Ashford (Briana Nicole Henry). She may think the PCPD needs to do some investigating. Sonny will discuss Kristina’s issues with Alexis later, so he’ll be back in PC where he belongs. It sounds like the same goes for Dante, but he’ll get quite a scare after he returns. Lulu Falconeri (Emme Rylan) will also make a frightening discovery, so this “Lante” reunion will come with some obstacles. GH fans will also see Anna Devane (Finola Hughes) make a tough admission. She’ll acknowledge the worst possible option, so this probably ties in with a hint she’ll receive earlier from Alex Devane Marick (Finola Hughes). Anna may admit to herself that Peter August (Wes Ramsey) may not be her son. It’ll break her heart to think about it, but General Hospital spoilers reveal that it’s true. Meanwhile, Jason Morgan (Steve Burton) will be taken into custody after a fierce fight. It appears he’ll face off with Shiloh at Kelly’s and get himself arrested in the process. Sam McCall (Kelly Monaco) will have to pick a corner here. She may choose Shiloh in hopes of advancing her plan. Finally, a shattered and bitter Ava Jerome (Maura West) will get some advice. Julian will be worried about his sister, so he’ll push Ava to get the help she needs. General Hospital spoilers say Ava will be a mess, so let’s hope she listens! We’ll give you updates as other GH news comes in. Stay tuned to the ABC soap and don’t forget to check CDL often for the latest General Hospital spoilers, updates and news. General Hospital Spoilers: Kevin’s Evil Plot Revealed – Is Franco Faison’s Next Pawn? General Hospital Spoilers: Hank’s Shocking Henrik Faison Connection – Peter Tied to Mystery Man from Drew’s Past?